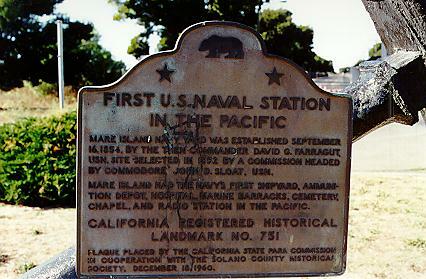 Mare Island Navy Yard was established September 16, 1854 by the then commander David G. Farragut, USN. Site selected in 1852 by a commission headed by Commodore John D. Sloat, USN. Mare Island had the Navy's first shipyard, ammunition depot, hospital, Marine barracks, cemetery, chapel, and radio station in the Pacific. 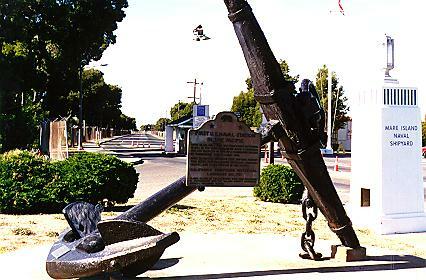 Entrance to Mare Island Naval Shipyard, main gate, SW corner of Tennessee St and Mare Island Way, Vallejo. Return to other landmarks in Solano county.